Thomas McGrory can take the heat. After all, he’s a member of Ladder 15, the Boston Fire Department house right near where runners turn left onto Boylston Street for the final 600 meters of the Boston Marathon. But then last fall McGrory, 30, began training for his first marathon, in Boston on Patriots’ Day. As anyone who’s run the April race knows, training for it means having drawers full of the right running gear and being prepared, mentally and physically, for a smorgasbord of weather—10 degrees and snowing one day, 30 and sunny the next, and come race day, it could be anything from 40 degrees to 70. Not too hot. Not too cool. While that makes sense for fighting fires, McGrory discovered that bigger and bulkier isn’t better for marathoners—even in the dead of winter. He revamped his running wardrobe, opting for apparel made of fabrics like merino wool that have a high warmth-to-weight ratio, quickly move sweat away from the skin, don’t chafe, and provide comfort through a full range of motion. In New England, where merino wool is traditionally associated with fall sweaters and ski layers, it’s also a surprisingly ideal fabric for marathon training, because of its breathability, temperature control, and resistance to odor. “I’ve got it all figured out now,” McGrory says after marathon training through a winter that featured frequent Nor’easters and single-digit high temperatures. McGrory was far from a slug this time one year ago. The West Roxbury native ran track at Bishop Memorial School. His specialty was the 400-meter dash—just a little longer than the distance from the 26-mile mark of a marathon to its 26.2 mile finish line. “I always liked running fast for short periods of time and getting it over quickly,” he says. McGrory also ran as required while in the Army for eight years. 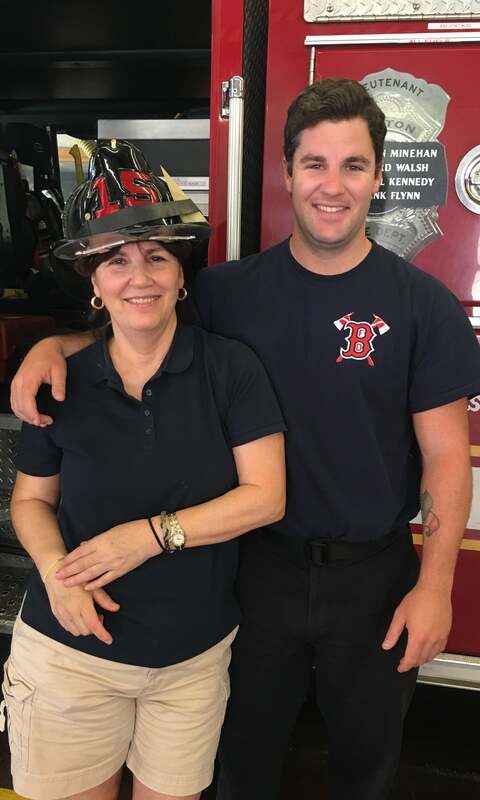 After leaving the military, he got his degree from UMass Amherst and then joined the fire department. “It was the next logical step after the Army,” he says. 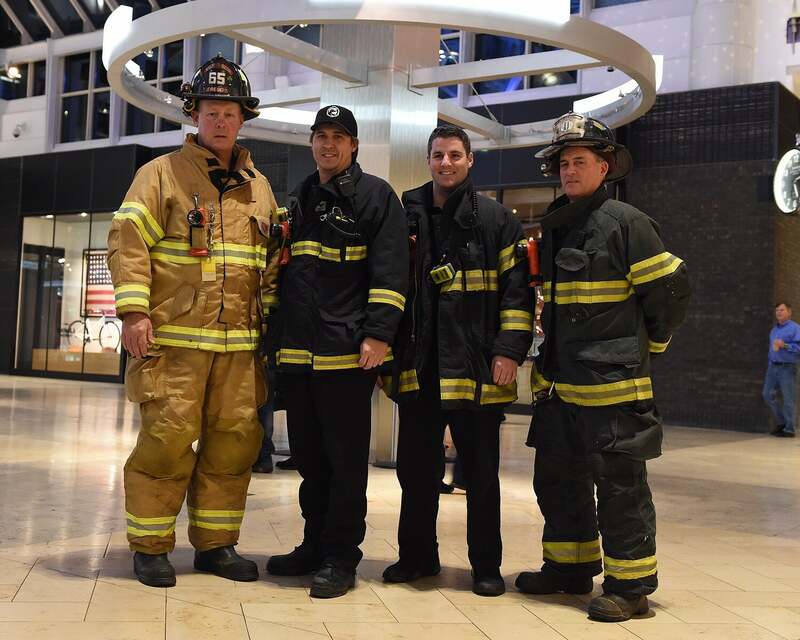 “I love being in the city of Boston and helping people.” For most of the three years he’s been a firefighter, McGrory focused his workout routine on lifting weights and other gym-based exercise. Then came last August. 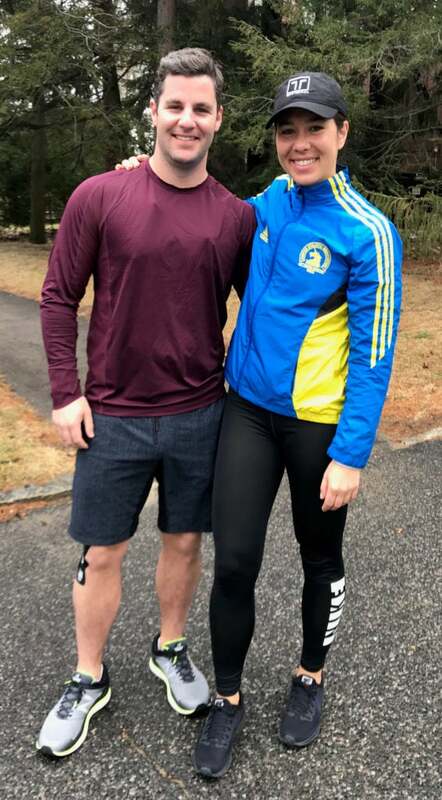 McGrory’s girlfriend, Alexandra Rosenfeld, said she wanted to run the marathon and asked him, “Would you want to run it with me?” McGrory said yes. “I thought it was one of those in-passing things,” he says. “I didn’t think I’d hear about it after that.” After a few months, however, Rosenfeld said it would soon be time for charity marathoners to sign up for Boston. “Oh, you were serious about that,” McGrory responded. Although Boston is famous for its qualifying standards for everyday runners, about 20 percent of the 30,000-runner field run to raise money for charity and don’t need a qualifying time. McGrory and Rosenfeld chose to support the Heather Abbott Foundation. Abbott’s left leg was amputated as a result of injuries she sustained in the 2013 Boston Marathon bombing, and she created her foundation to help provide customized prostheses to amputees who have lost limbs to traumatic circumstances.